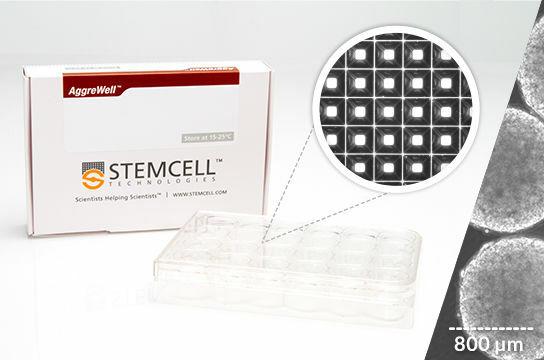 AggreWell™ plates provide a simple, user-friendly method to generate large numbers of highly uniform 3D spheroid cultures. 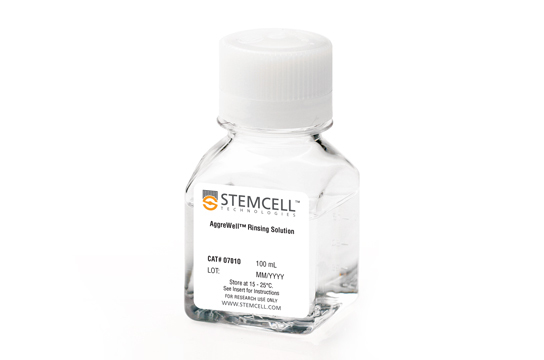 Compatible with a wide range of cell types, AggreWell™ can be used for many applications, including directed differentiation of pluripotent stem cells (PSCs) using embryoid body (EB) protocols, as well as cancer research, drug discovery research, and suspension culture. AggreWell™ plates contain microwells which are 400 µm (AggreWell™400) or 800 µm (AggreWell™800) in size, providing flexibility to generate spheroids of desired size for your research. Why Use AggreWell™ to Generate EBs and Spheroids? EASY. Simple spheroid generation protocol. REPRODUCIBLE. Produce large numbers of uniform spheroids, with consistent size and shape. SIZE-CONTROLLED. Control the size of the spheroid by modifying the cell seeding concentration. HIGH YIELD. Up to 4,700 spheroids per well. COST EFFECTIVE. At a fraction of a penny per spheroid, AggreWell™ enables scaled-up production of spheroids and EBs from a single plate! Watch this short video to learn more about how AggreWell™ works to generate uniformly-sized and shaped 3D spheroids and embryoid bodies. 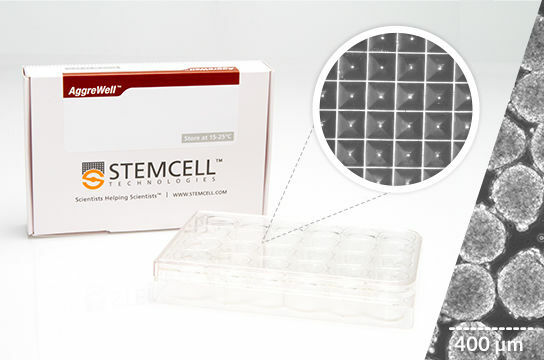 AggreWell™ works by adding a single cell suspension to the wells containing microwells, and then centrifuging to distribute the cells evenly in the microwells. Incubate overnight and assess the spheroids after 24-48 hours. Then culture in the microwells, or harvest and perform downstream assays. Preparation of AggreWell™ plates to remove bubbles from microwells and promote efficient spheroid formation.